Donald Trump New Hampshire lead: Triples nearest rival in one poll. 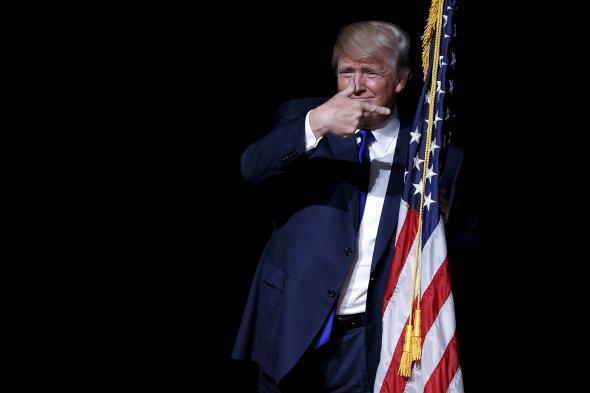 Donald Trump points at a flag in Derry, New Hampshire, on Aug. 20, 2015. In a FiveThirtyEight world of enlightened polling analysis, we know that we shouldn’t overreact to any one given poll. We know that the New Hampshire Republican primary is still several months away. And we know that the margin of error on the CBS/YouGov poll of 610 likely New Hampshire GOP primary voters conducted Sept. 3–10 and released Sunday is 5.1 points. But still, holy cats, look at Donald Trump’s lead up in this thing. In the RealClearPolitics New Hampshire running average, Trump has a slightly less spectacular but still substantial lead.